EVERYONE LOVES A LITTLE FRIENDLY COMPETITION! Are you doing an energy saving project? Don’t keep it to yourself – we want to hear about it! admin@usgbcwm.org and tell us what you're doing. You may be featured as an energy leader in our newsletter, blog or social media outlets. Do you have more than one building in the battle? Offer a prize to the building who has the greatest reduction. It could be as simple as a pizza party. 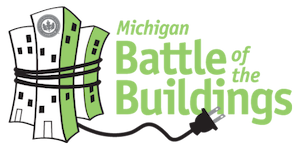 Leverage your involvement in the Battle of the Buildings competition to engage your building occupants in energy savings. Don't be surprised when you see people get excited and take an active approach to help reduce energy waste. Share with employees, competitors, and the public that your company has joined the energy reduction war by downloading, saving, and sharing the press release, web buttons, and banners we've created for you. Or get creative and create your own Battle content. We'd love to see what you come up with! right click (ctrl+click on mac) and select "Save Image As..."
created some videos to share their energy reduction story. You can too!